NOGALES, Ariz. - The Vice President's trip to Nogales did not include any time -- with some leaders who would have loved a chance -- to share what they see as priorities for the border. A Border Wall has stood in Nogales for many years. The razor wire is a new addition that shows how the border debate has cranked up. 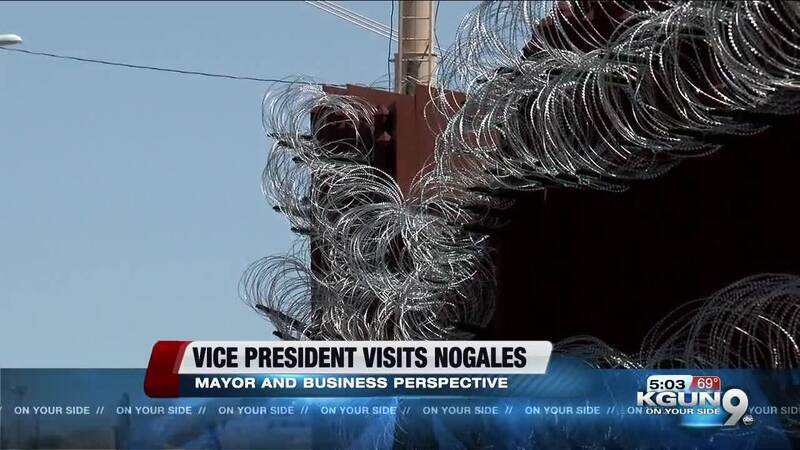 The razor wire is a sharp, shining insult in the eyes of Nogales Mayor Arturo Garino. He feels it could hurt children and pets and hurt Nogales reputation and cross-border business by building a threatening atmosphere the city does not deserve. If he could have some time with the Vice President he says he'd urge the administration to fix an immigration policy that he feels encourages people to come. “We're giving them all these incentives. If you make it over here you've got it made and that's the thing. Why wasn't this happening five, six years ago. Why now because they know it's a problem and they know what the problem is and it's not an open border thing, it's not a wallet, it's not a security thing. It's the wrong message we're giving them, we have to be a little bit stronger." The mayor says border uncertainty has discouraged Mexican shoppers from making day trips to Nogales and he worries Nogales busy cargo port will choke as the administration shifts officers from Customs inspection to processing people. That manpower shift threatens the millions of dollars in fruit and vegetables that cross the border at Nogales. Produce shippers were already worried ports were very short of inspectors. Jaime Chamberlain of JC Distributing says, "250 agents is where we're short just to handle the flow of traffic that we already have. That doesn't include want entrepreneurs all over the state want to increase their business and increase the flow of traffic." And that business flows both ways with U.S. businesses selling their products to Mexico.